The error of EPA’s main takeaway is it attempts to reach a uniform conclusion about a set of activities and impacts that are far from uniform. Impacts that are not “widespread” or “systemic” are still impacts – even if they are outliers, infrequent, rare, localized, or poorly understood. These impacts matter, and they should not be ignored even if they do not happen at every site and do not happen all the time. In attempting to reach a broad conclusion, the Agency has developed a message that is unclear at best and misleading at worst. The statement must be modified – or it risks supporting the notion that these practices are conclusively and inherently “safe” – drowning out 1,000 pages of research and years of work, and discounting a number of confirmed and potential impacts cited in the new report. No interests are served by translating years of work into a one-sentence summary that does little to advance our understanding of today’s operations and their potential impacts on communities. We can’t expect one report to answer every question about the impacts of hydraulic fracturing activities, and the agency should not let this report be the final word on the matter. A lot of additional research is clearly needed, and EPA should use this assessment – and what the agency learned in compiling it – to emphasize priority research needs that could support more definitive answers in the future. Burying uncertainties, limitations, and unknowns deep in the pages of this report isn’t helpful. EPA is in a powerful position to use this experience, and its authority, to develop and recommend a research agenda that can have a real impact on the way we understand and address risks from hydraulic fracturing activities in the future. We need the agency to clearly explain what the important research needs are as well as the key questions that must be answered to allow for a better review in the future. The public is looking for a straight answer from EPA on what to worry about, what not to worry about, and why – and the current message has done little to address that need. It may not be short and “sweet” like the original summary, but it’s what the public deserves. EPA has drafted a good report that will serve as a great resource and springboard for future research. But it needs some key improvements, and that’s what we’re continuing to advocate for at the Science Advisory Board as they continue their review of the draft this spring. We’re also advocating for timely finalization of SAB’s review and EPA’s report before its value is diminished with the passage of time. Swiftly improving and finalizing this initial EPA Assessment is necessary to improve the way we understand and manage risks associated with hydraulic fracturing. It’s time to turn our collective attention to what matters most: gathering new data, conducting new research, and putting smart policies and practices in place to reduce these risks and protect public health and the environment. 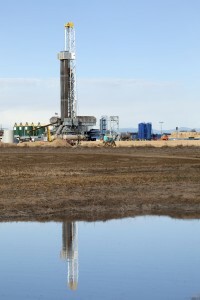 EPA Looks at Fracking Risks to Water: No Data, No Problem? This entry was posted in Natural Gas and tagged EPA, policy, produced water, science. Bookmark the permalink. Both comments and trackbacks are currently closed.